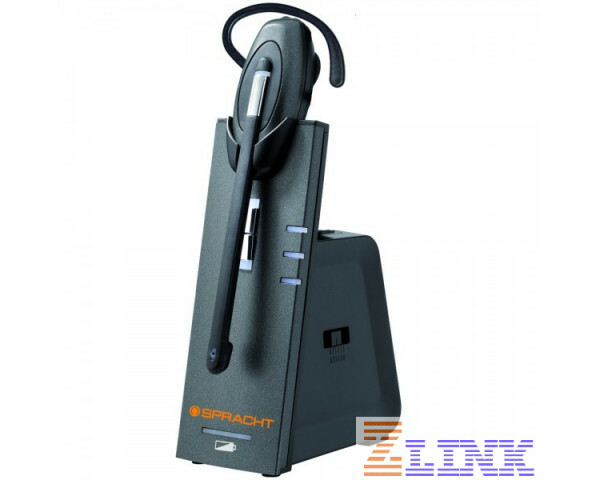 The Spracht Zum Eco-Dect Pro Headset (HS-2014) is a two in one solution that not only provides a reliable communication tool, but also reduces the amount of power output and radio frequency that is produced by the headset. The Zum Eco-Dect Pro headset is for the user who spends a lot of time on the phone and requires freedom to move around, comfort and great voice quality. The Spracht Zum Eco-Dect Pro Headset (HS-2014) is a two in one solution that not only provides a reliable communication tool but also reduces the amount of power output and radio frequency that is produced by the headset. The Zum Eco-Dect Pro headset is for the user who spends a lot of time on the phone and requires freedom to move around, comfort and great voice quality. The Spracht Zum Eco-Dect wireless headset is an "eco" headset because when the headset is docked in the base station in standby mode, the headset stops emitting radio frequency, thus reducing the RF emissions. When the headset is in use, the eco-DECT technology ensures a safe power output, with minimal emissions. The headset adjusts the radio frequency power output in four steps depending on the distance between the headset and the base. The closer to the base, the lower its power output. Range up to 500 feet (150m). Dynamic Power Adjustment means lowest level of emissions based on distance from the base station. Over-the-head headband and over-the-ear hook styles both included and provide all-day comfort. About 7 Hours of talk time. Noise-canceling microphone reduces background noise. Conference call with up to three callers. Full USB Voice for PC or Mac calls. Optimized for Microsoft Lync, Skype for Business, Skype, and other VoIP platforms. Use with Electronic Hookswitch or Remote Handset Lifter (RHL-2010) to answer and end calls remotely (both sold separately). A spare battery can recharge in the base while in use, and the battery is hot swappable.